The Love family has made a significant impact on the community through their philanthropy. By working with the Oklahoma City Community Foundation, they are able to utilize their Love's Travel Stops & Country Stores to perpetuate support of the causes important to them. Tom and Judy Love began their journey to becoming effective philanthropists in 1964 when they leased an abandoned filling station in Watonga, Okla. Today, their family-owned and operated company, Love's Travel Stops & Country Stores, has grown to include more than 260 locations along interstates and highways in 39 states and is one of the country's top privately-owned companies. The Love family has utilized their company's success to give back to the community. "Charitable giving is important to us because we have been so blessed that we feel it is very important to share with others," explains Judy. 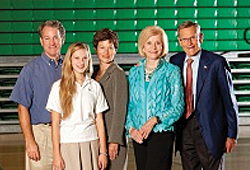 In 1999, the couple established the Love Family Affiliated Fund. In recent years, the family has directed a number of their Love's Travel Stops & Country Stores locations to their fund at the Oklahoma City Community Foundation. The monthly lease income from each location generates cash that is used as charitable distributions from the Love Family Affiliated Fund to a variety of nonprofits including faith-based institutions such as Bishop McGuinness High School. The Oklahoma City Community Foundation can accept a variety of gifts in addition to cash including stocks, bonds, mutual funds, life insurance, retirement plan assets, real estate and mineral interests. For a complete list of the types of charitable gifts we accept and a copy of our gift acceptance policy, click here. For more information contact Joe Carter at 405/606-2914.